Welcome to the world of abnormal child psychology! This website provides teaching and learning resources for faculty and students interested in child and adolescent disorders, their causes, and their evidenced-based treatment. This site may also be useful to parents, teachers, and others who want to learn more about psychological problems experienced by youths and their families. 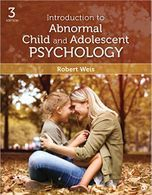 This website accompanies Introduction to Abnormal Child and Adolescent Psychology. This text is completely revised and expanded to reflect new advances in the research literature and clinical practice since the publication of DSM-5 several years ago. Although relatively few students will become mental health professionals, everyone can rely on psychological science and critical thinking to make informed decisions about the welfare of children, families, schools, neighborhoods, and society. This book, and website, is designed for anyone who wants to learn more about helping children through the combination of psychological science and compassion and care.